How true is this quote?!? In honor of Pinterest, compulsive exercising and baked goods, here are a few things on my summer bucket list. I will definitely be making a few of these sentence strip Question of the Days to introduce my kids to the concept. PERFECT for fall when they don't all know how to write their names. Math game storage. Hallelujah! I'm not going to lie... I LOVE LOVE LOVE teaching literacy but math... not so much. Having my games all organized and ready to go will be a huge help and just make everything 100 times easier. And last but not least, I LOVE this video. I need to pick up a few of these attention grabbers. How amazing are these kids? Let's be honest though... you know there have to be one or two off camera rolling around on the rug or poking someone with a pencil. LOL, I have seen that same pin before and it always makes me laugh because it is true. 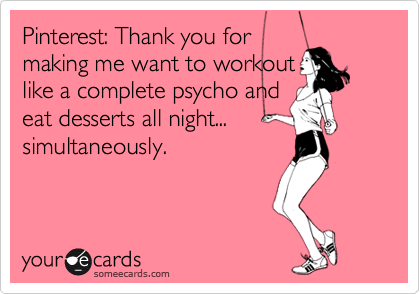 I'm very addicted to pinterest and I'm working on getting my up and running again because I had to delete my account.